Get out your arts and crafts supplies, it’s time to whip up some DIY snail mail. 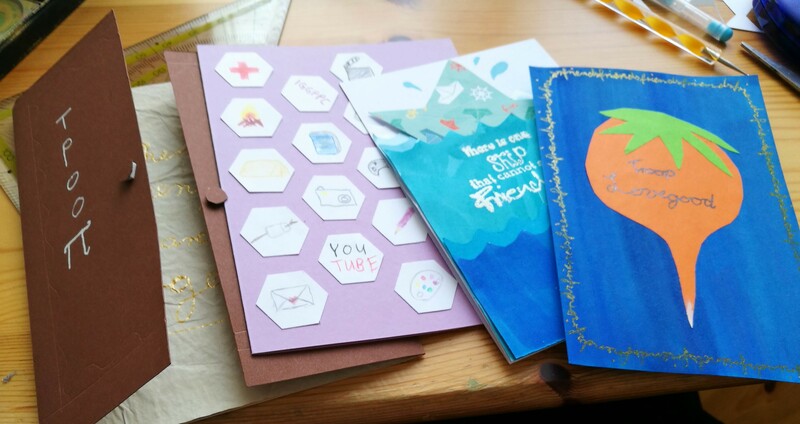 Today we are making cards that you can send to your fellow campers. We are going to make one non-troop themed and one card for each troop. Let’s start with the non-troop themed card! For this you’ll need a card base in the colour of your choice. You’ll also need a punch in a geometric shape of your choice. If you don’t have one, feel free to cut the shapes out yourself. Bigger shapes will make it easier for more detailed pictures. Smaller shapes will make it easier to not enhance your poor drawing skills. You’ll also need drawing supplies or a printer. Take your card base and cover it in your geometric shapes, and glue them on to your card base. 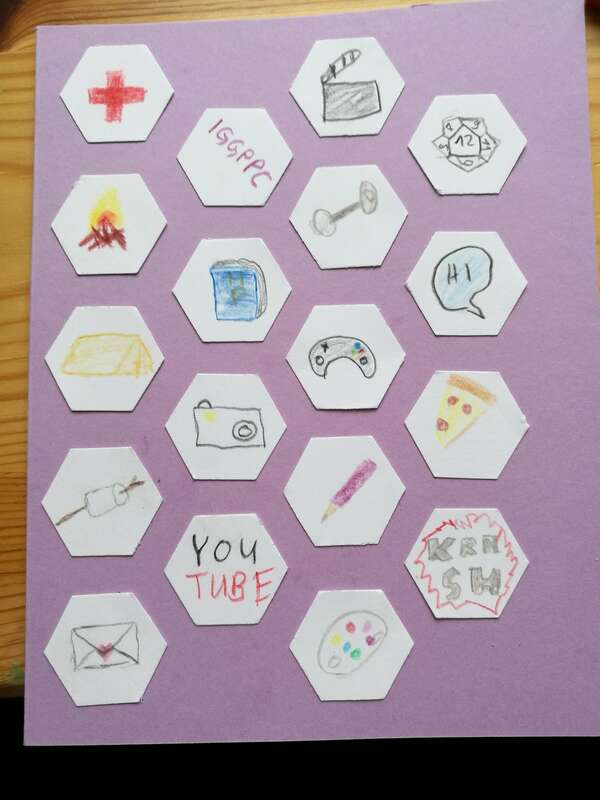 Draw different badge themes on your shapes. I took inspiration from the icons for all the activities on the IGGPPC main page (scroll down to see what I mean). If you can not draw at all, just print out those icons and use them instead of geometric shapes. 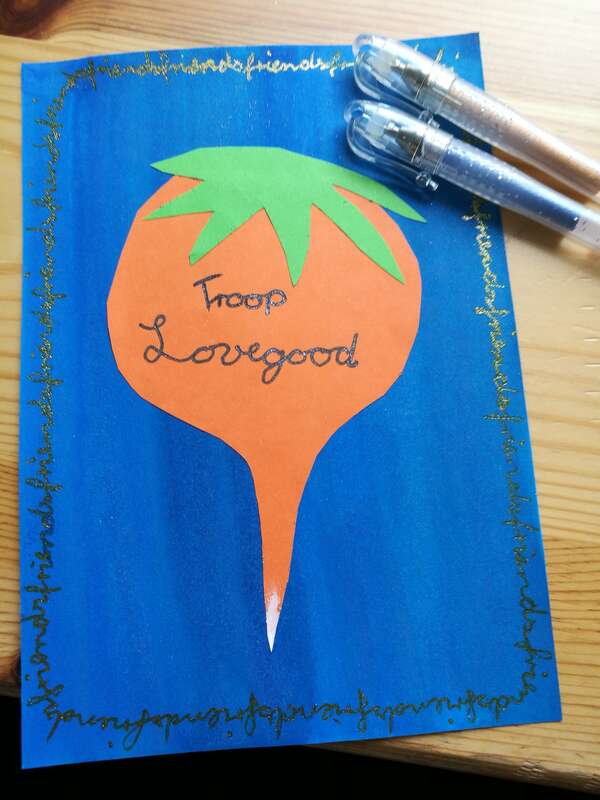 For Troop Lovegood, we start with a dark blue card base. I only had medium blue so I painted one dark blue. Then, cut a dirigible plum out of orange and green cardstock. I painted the end with a white gel pen. I also wrote the troop name in with blue gel pen. 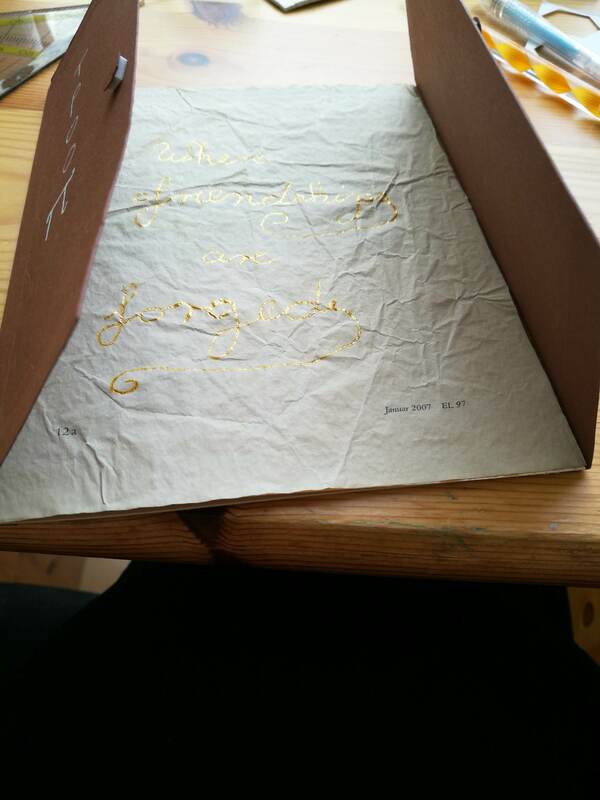 I made a frame around the card, writing “friends” with a bronze gel pen like Luna did with the picture of her friends! You could also stick a picture of your pen pal in the middle instead of a dirigible plum. 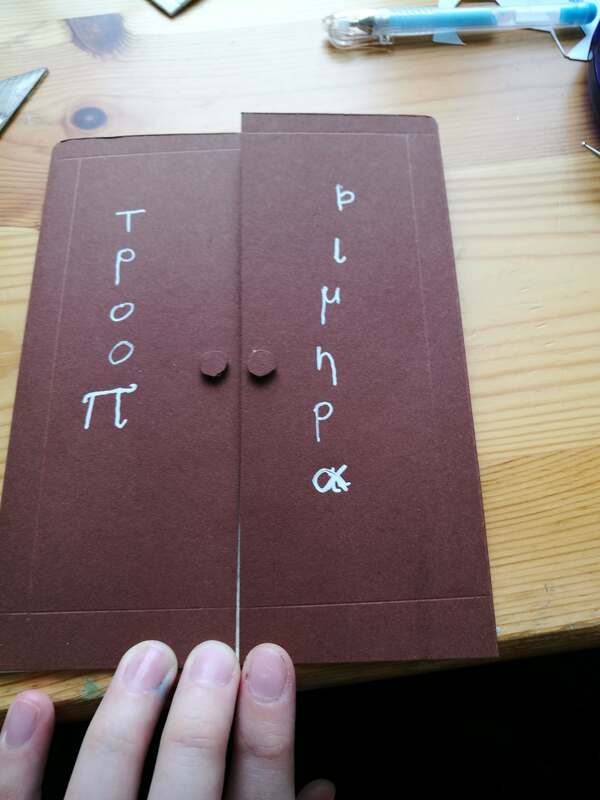 You also need brown cardstock that is a little wider than the front of the card. 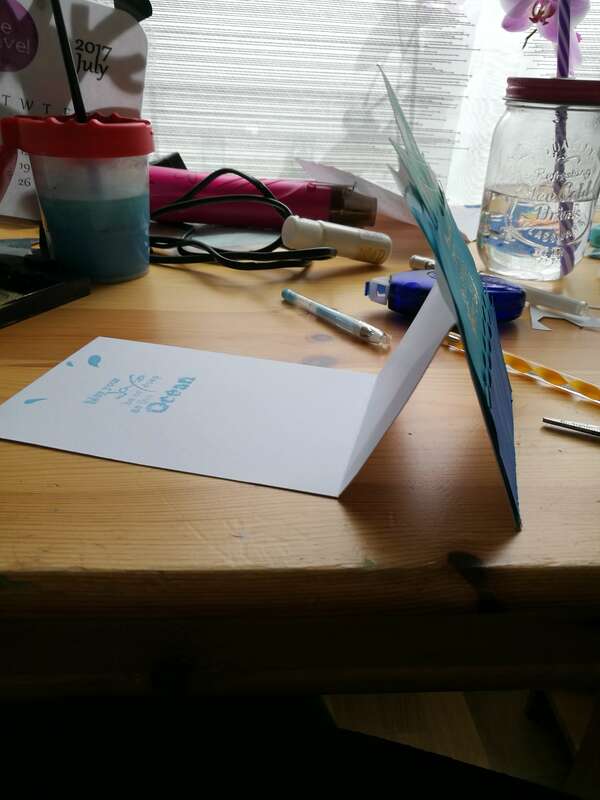 Cut it in the middle then glue the two long edges to the sides of the card, so it opens in the middle like a wardrobe. I also cut out brown dots and glued foam dots under them so they look like door knobs. I made score lines to make it look even more like a wardrobe. I used a dotting for this. I also wrote “Troop Chimera” in Greek-inspired lettering in white gel pen on the front, and wrote “Where friendships are forged” on the inside with a bronze gel pen. Then I cut wavy borders from a variety of blue cardstocks and one piece of white transparent paper. I also picked out a sentiment and decided where I wanted to put it. Next I spaced out the blue cardstock the way I wanted them to be and glued it all together. 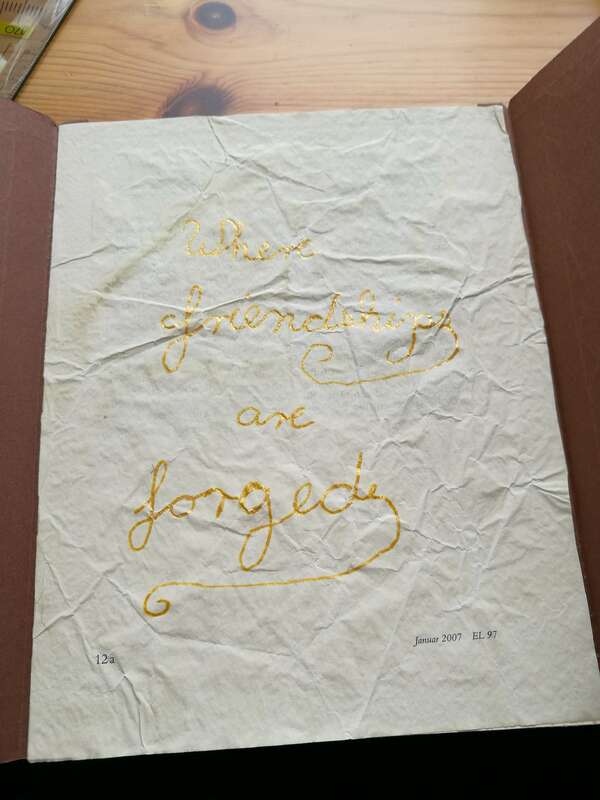 I stamped the sentiment on top with Versimark ink and embossed it with white embossing powder. 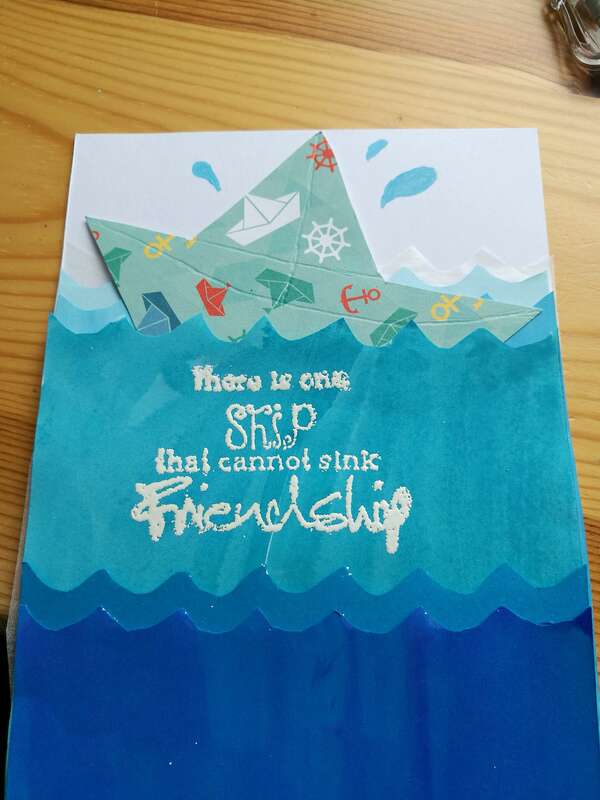 I cut out a boat out of a patterned cardstock and glued it in between the waves. I also added some water splashes with a blue gel pen. I hope I could inspire you to make your own cards. Feel free to put your own twist on your card and share them on Twitter or Instagram using the hashtag #IGGPPCCC (IGGPPCCampCards). Let’s collect ideas there too, like: if you are missing some supplies and need an idea on how to make the card, or, if you want to send cards to several people and need ideas for design variety. If you have any questions or need help, hit me up for a chat on Twitter @crowlovescore, and don’t forget to use #IGGPPCCC too, so others can see it! Meike lives in Cologne, Germany and has finally finished her law education. She gets exited about all things super hero or disney. If she is not at work or super tiered you are most likely to find her on her floor among craft supplies/sewing supplies either crafting, sewing or writing snail mail or both. She also recently discovered the out doors for herself so you might also run past her sitting outside writing and singing along to Fifth Harmony, Vaiana/Moana or Hamilton. Feel free to hit her up for a chat on twitter @crowlovescore or follow her on instagram itscrowlovescore.